Stroboscopic photography is a special technique that allows one to freeze the motion of moving objects. The trick is to trigger the flash several times while keeping the shutter open. The effect of the multiple exposure is spectacular. The object is captured several times on a single image, stopping its motion at different points in its trajectory. Physicists who wish to understand ultrafast processes in atoms and molecules can't help feeling a little envious when they come across conventional images taken with the help of a stroboscope. In the world of femto- or attosecond physics, it has only been possible to take single snapshots of the motion of ultrafast particles, such as electrons. Such snapshots are taken with the help of light flashes generated with the aid of ultrashort pulses of laser light. But the quantum dynamics of electrons can change in a matter of attoseconds – an attosecond is a billionth of a billionth of a second (10-18 sec) – too fast to be captured as sharp images with these exposure times. Electron configurations in atoms also fluctuate on attosecond time-scales. Using a high-power ytterbium fiber laser as their light source, the team has been able to generate trains of attosecond pulses at a rate of 78 million per second (78 MHz). Each train comprises about 20 individual attosecond flashes. The laser pulses used to create the attosecond flashes were first coherently enhanced in a so-called passive optical resonator – a system of mirrors forming a cavity in which the light is reflected back and forth more than a hundred times before escaping. Each time a wave pulse hits a particular mirror, it is amplified by the synchronous addition of a succeeding pulse. This superimposition of waveforms allowed the scientists to enhance the amplitude of the initial pulse, which was about 50 femtoseconds long (a femtosecond is a millionth of a billionth of a second or 10-15 sec) by a factor of 250, while improving its stability. These pulses were then focused on a target made up of a cloud of argon atoms. The atoms absorb the energy and rapidly re-emit it in the form of attosecond flashes of radiation. These ultrashort pulses were then selectively coupled out of the resonator by means of a clever filtering method. This involved directing them at a pierced mirror with an aperture that was just big enough to let the attosecond pulses pass through without significant perturbation. In this way, the scientists were able to generate attosecond pulse trains at the rate with which the ytterbium fiber laser emitted light pulses, 78 MHz. The attosecond flashes thus produced consist of extreme ultraviolet radiation, with wavelengths of between 10 and 100 nm. Moreover, the radiation is coherent – the light waves oscillate in phase – and the energy of the light particles (photons) is around 100 eV – about 4 times higher than has ever been achieved before at such repetition rates. 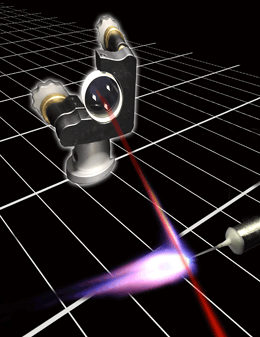 Taken together, these features have the potential to revolutionize research of the microcosm with the help of photons. The extremely high rate of data acquisition will, for the first time, make it possible to follow the dynamic behavior of electrons, in the same way as photographs taken with stroboscopic illumination enable one to stop the motion of macroscopic objects.